Planned Parenthood Fights Back : It's All Politics In a new report sent to Congress, the organization says controversial videos alleging the sale of fetal tissue are "heavily edited" to "significantly distort" actual events and conversations. Anti-abortion activists demonstrate near a Planned Parenthood clinic in Philadelphia in late July. In a new report and letter sent to congressional leadership, Planned Parenthood contends that controversial videos alleging the organization sells fetal tissue have been "heavily edited in order to significantly change the meaning" of what its staff said. The report is based on an analysis by forensics firm Fusion GPS, which was commissioned by Planned Parenthood. "We've said all along that the videos were heavily edited to deceive the public and now we have expert, independent analysis that confirms it," said Dawn Laguens, executive vice president of Planned Parenthood Federation of America. The videos, which were released by the anti-abortion activist group Center for Medical Progress, have prompted calls for congressional investigations, which are expected to begin next month. 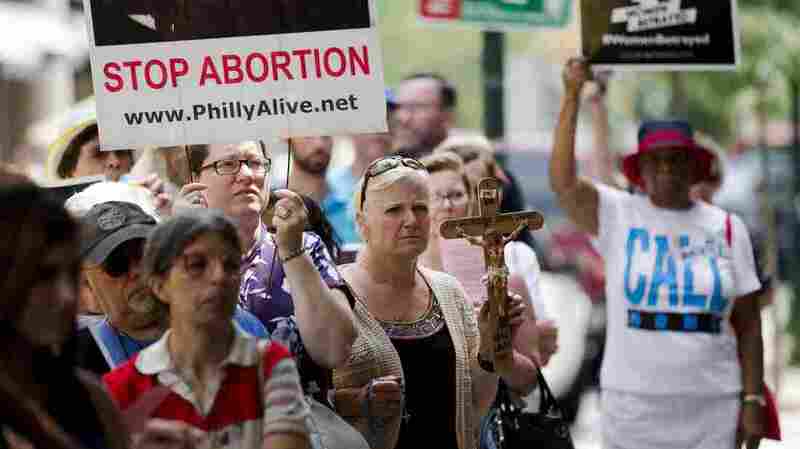 There have also been public protests over the weekend around the country, both condemning and defending Planned Parenthood. The Fusion GPS analysis shows the videos were edited, cutting between undercover footage, graphics and interviews with a woman the group calls only an "ex-procurement tech." CMP also posted several hours-long videos labeled "FULL FOOTAGE" on YouTube, but Planned Parenthood said even the longer videos and transcripts are heavily edited. Planned Parenthood called on the group to release its full source footage. Fusion GPS's Glenn Simpson also called the video files "unreliable," contending that uploading them on YouTube distorted the quality of the audio. His firm says its analysis, supported by an outside transcription service, found one part of a video where CMP transcribes a doctor saying "it's a baby" when the audio is actually unintelligible. In the letter to Congress, Planned Parenthood President Cecile Richards said that her organization has not broken any laws. She also said "99% of our health centers do not participate in tissue donations and all of them comply with all laws and provide essential health services to women and men." Five states have found no wrongdoing by Planned Parenthood after investigating the organization. CMP released a statement Thursday calling Planned Parenthood "desperate" and defending its use of editing. "The absence of bathroom breaks and waiting periods between meetings does not change the hours of dialogue with top-level Planned Parenthood executives eager to manipulate abortion procedures to get high-quality baby parts for financially profitable sale," the statement read. CMP also called on Planned Parenthood to "release their fetal tissue contracts with the for-profit company StemExpress for law enforcement, Congress, and all the world to see." One activist from CMP, David Daleiden, told the New York Times last month that he could have thousands of hours of videotape recorded over 2 1/2 years and that he has enough footage to keep releasing videos.